I really thought that by this time of year, I could safely unclutter my brain with recipes and ideas for warm-up-your-body soups until next winter, but I guess that would have meant expressing way too much optimism. From hot weather a week or so ago, we are back to fall with a non-stop rain, which just keeps coming down! It has not stopped for 2 days now, so much so that I really feel as if we were living on some kind of tropical island during rain season! Where is it coming from? I guess I can put my French dicton au placard (French saying in the closet). (In May do as you please). Forget about that! I am back with boots and sweaters! Anyway, so here I am, feeling like having a bowl of soup, with bread and some kind of grilled meat for lunch on Sunday in New England. I dug out a cookbook I will talk to you more about over the coming weeks, in which I found a recipe that I adapted for our Sunday tastebuds. I had a butternut squash, prosciutto and ginger in the fridge. All set to make a squash soup. What do I like about this soup? It has this amazing deep orange colour, it is sweet, smooth. Crystallized spicy ginger and grilled prosciutto (I know, I know, a shame to grill prosciutto but I only had that!) balance out its sweetness. With as the cherry on top of the cake, fried Irish potato bread. And this is what happened: as I was cooking the prosciutto along with the slices of the potato bread -which I had frozen after my mother-in-law’s last visit back from Ireland-, I suddenly heard the word “Bacon!” coming from the top of the stairs. As lunch was brought to the table, P. looked at me, the soup, the bread, the grilled prosciutto, then he turned his head towards the window and looked at the pouring rain before saying, “Mmmmm, I feel like we are in Ireland”. It is true that it felt as if we could have been at his grand-mother’s house, eating bacon and fried potato bread. I am pretty sure we would not have had ginger with our soup there, but surely the best potato bread or brown bread to be found. As we are stuck inside due to a crazy pouring rain, the morale of the story is the following: the weather might have sucked but we still managed to feel it was sunny. Because of the bowls of warm orange soup and its accompanying goodies. It really made our day! I am hearing that it is supposed to rain for the whole week. Lucky that I made a big batch of soup! And by the way, I thought of mentioning that during all of next week in France, we are celebrating a great food event: la fête du pain (Bread Festival) with as a theme “Faites des tartines”, in other words, making spreads for slices of bread. 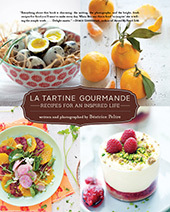 Yes yes, tartine as in La tartine gourmande! I will have to make something, even if I am not in France, ’cause in case you did not know, I love tartines! And why starting tomorrow? Because May 16th is the celebration of St Honoré who is the patron of all bakers! Melt the butter in a thick-bottomed pot. Add the peeled pumpkin, sugar and coarsely chopped ginger and stir. Cover and let sweat for 45 mns on low heat, stirring occasionally. Remove the lid and let cook until most of the juice is evaporated. Add the white wine and let evaporate (a few mns only). Add the chicken stock and cream, and cook for 10 mns. Let cool and mix with a blender. Julienne the ginger and sprinkle with confectioner’s sugar. Mix together and put on the side for 45 mns. Heat the canola oil in a frying pan (enough oil to be 1.5 inch high), and when the temperature reached 300F, add the julienned ginger and fry for about 30 s, or until browner and crispy. Remove and put on paper towel to absorb the excess oil. Sprinkle with confectioner’s sugar and set on the side. 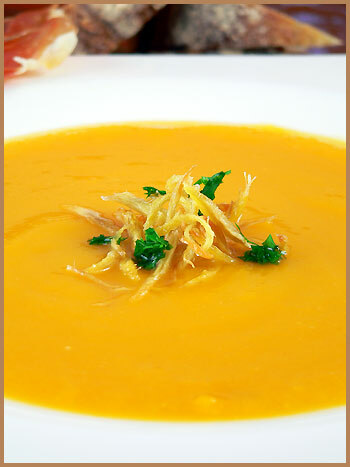 To serve the soup, take a bowl and pour a ladleful of soup, add the crystallized ginger, some chopped parsley and fried prosciutto slices. With bread of course! Ajoutez les morceaux de courge, le sucre et le gingembre coupé grossièrement. Couvrez et laissez suer pendant 45 mns sur feux doux, en remuant de temps en temps. Retirez le couvercle et laissez le jus s’évaporer. Ajoutez le vin blanc et laissez à nouveau s’évaporer. Ajoutez ensuite le bouillon de poule, la crème et laissez cuire 10 mns. Laissez refroidir un peu avant de passer votre soupe au mixer. Couper le gingembre en julienne fine et saupoudrez de sucre glace. Mélangez et mettez de côté pendant 45 mns. Rinsez et séchez dans du papier absorbant. Faites chauffer l’huile (4 cm d’huile dans la poêle) et lorsqu’elle atteint la température de 150 C, faites frire le gingembre pendant 30 s, ou jusqu’à ce qu’il brunisse légèrement (il sera croustillant). Retirez et déposez-le sur du papier absorbant pour l’excès d’huile. Saupoudrez-le de sucre glace et réservez-le. 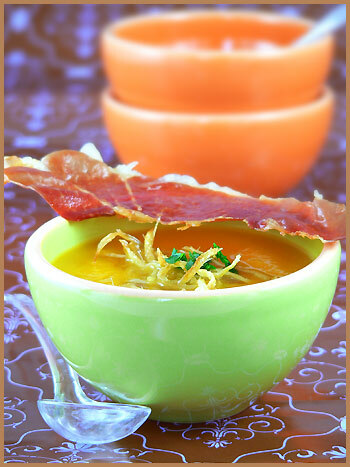 Pour servir la soupe, versez une louche de soupe dans une assiette creuse ou un bol, décorez de gingembre cristallisé et de persil, et accompagnez de tranches de prosciutto grillé et un bon pain! I bet that soup was most comforting on a rainy day. I love the colour of the bowls against the soup. And the crisped prosciutto is the perfect touch. Che bello! J’adore l’idée du gingembre cristallisé dessus et aussi le fait d’en ajouter dans le potage, c’est une sublime recette tout commme les photos! Bea, sounds and looks really nice and comforting! Elle est magnifique Bea, c’est une excellente idee. Je suis sure que tous ces gouts vont tres bien ensemble. J’ai teste l’autre jour une soupe de patates douces avec des epices a massale, un vrai delice. Tu me donnes tres envie. Yummy!! drooling over your photos! So nice! I like it! 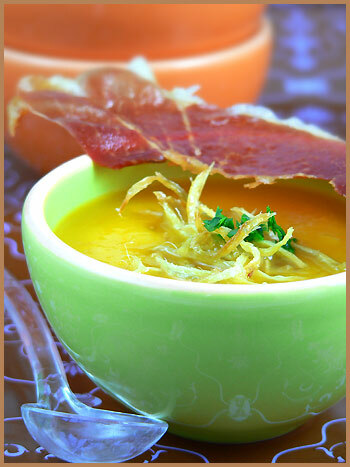 Bea, i simply love pumpkin soup and the piece of cripsy prosciutto is the perfect garnish and color contrast for this picture! Beautiful. The pumpkin soup looks fabulous. I am also a big fan of crisp prosciutto. Excellent photographs. i so wish we had need for soup to warm us here, but with temperatures in the 100’s by mid morning, i think i will need to file this recipe away for fall! it sounds so very good! and with irish potato bread? perfect! I love pumpkin soup! What makes yours extra special is the addition of both gingers! I’ll keep that in mind the next time I’m in the mood for this soup. What a nice combination. I note your recipe of the crystallized ginger. Thank you. I feel your pain, it’s so gloomy here in California as well. This soup looks perfect for our pre-gloom June weather. Love pumpkin anything! I can live on pumpkin soup alone. Fortunately I do not have to … LOL. 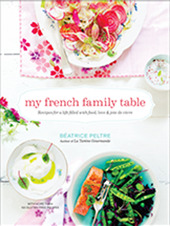 Fab post & I love the cheery lime green of the bowl. how do you say butternut squash in french?